Those who have worked with or watched Winslet since her arrival in U.S. popular culture aboard James Cameron’s unsinkable Titanic know DiCaprio’s assessment isn’t empty approbation. To see Winslet slip so fully into the character of a tortured former Nazi sympathizer in The Reader is to see an actor’s actor at work. To see her capture in small gestures the private loss of suburban disaffection in Revolutionary Road is to witness a performance of preternatural grace. But to witness both in one weekend is to become immediately aware that Winslet is now setting the standard for film actors everywhere. With five Oscar nominations in ten years, Winslet’s long been on the list of legends-in-the-making. The youngest actress ever to receive two, then three, then four, then five Academy nods, Winslet’s always been a lady who leads. She made her first appearance on the cover of Vanity Fair a decade ago, and she again graced it this past December. And when this year’s Academy Award nominations are announced in late January, industry insiders are expecting Winslet’s name to appear again—even, perhaps, twice—placing her in a different kind of category, as a member of the “why the hell haven’t they won yet?” club. Populated by some of the greatest actors of all time, it’s both a discon- certing distinction and a hard-won honor, usually reserved for those who so consistently deliver pitch-perfect perfor- mances that a viewing public and an industry in love with the New and the Next consistently take them for granted. If this has been the case with Winslet, one gets the feeling this award season will shake the Hollywood voters out of their complacency and place a golden statue in the British icon’s hands. That degree of desire, along her pleasantly surprising forthrightness, has defined Winslet’s steadily spectacular career. 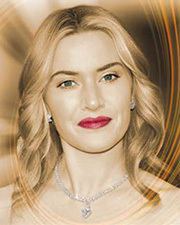 From her early days working the British stages and small screens, to her film debut in Heavenly Creatures, directed by Peter Jackson (pre-Tolkien obsession), to her perfect youthfulness in Ang Lee’s Sense and Sensibility and Kenneth Branaugh’s Hamlet, Winslet has never shied from difficult roles, be they delightful or, as has more often been the case, disquieting. Keenly, she has made a name for herself dis- secting the lost innocence of youth and beauty, playing a young student who conspires with a friend to kill her mother, a bored and desperate housewife who seeks respite from the confines of motherhood, an aging Nazi guard who seduces a young boy. Roles like these have won her acco- lades, and the critic’s favorite adjective: fearless. “If I’m freaked out by it and think I could never do that, that makes me think I should be doing it,” she said. The struggle was well worth the effort, as Winslet is now comfortably ensconced in the Hollywood pantheon, accompanied now by her director husband of five years, Sam Mendes (who shares her roots: the two were born ten years apart in the same small hospital), Mia, her eight- year-old daughter from her first marriage, and Joe, her and Mendes’ five-year-old son. Their homes in New York and the Cotswolds, in England, are havens from the flurry and frenzy of their Hollywood schedule. Rarely at home these days, Winslet’s work this past year has kept her one of the busiest women in the business. Those stunning photos, untouched by digital knives (except for her skin tone nothing was retouched) and released in advance of two Oscar-worthy performances, will only enhance Winslet’s iconic status and rise to becoming one of the greatest female actors in the history of film.